As confirmed theatre lovers we're a little tentative about entering the comedy section of the Fringe programme. But with several serious and dark shows in our plans we wanted to ensure we had a bit of fun as well. As we don't follow the stand-up circuit, choosing can be a risky business - especially as we're keen to avoid any audience interaction. However, thanks to a ticket offer in Scotland on Sunday we had the chance to see a show without concerns of wasting our cash. 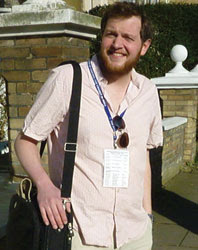 Miles Jupp's tale of blagging his way onto the press corps for an England cricket tour fitted our timeframe, seemed suitably unthreatening, and fortunately proved to be genuinely funny. Jupp makes for an amiable host and his tale, while more interesting to cricket fans, is perfectly accessible to those like us with only a passing knowledge of the game's bigger personalities. He's also very self deprecating and his gentle humour makes the hour fly past. Despite any disapproval I may have felt of attempting to pull off such a charade, Jupp quickly had me onside and willing him to succeed. I suspect any serious stand up fans will find the show too tame for their taste but as an engaging storyteller Miles Jupp provides a delightfully entertaining and risk free evening.